Otoplasty, commonly known as ear surgery, is a surgical procedure designed to correct or “pin back” protruding ears. Ears that project further than normal appear unnatural to many people, and can therefore be a cause of poor self-image. Who can benefit from otoplasty? Ear surgery can benefit people of all ages, but it can be especially beneficial for children with protruding ears who experience teasing from their peers. After about 5 years of age, the ears are sufficiently developed to perform otoplasty. When the procedure is done early, it can help alleviate the distress of teasing and promote a healthier self-image. During otoplasty, Dr. Branman makes very precise incisions behind the ear to expose the cartilage. To reposition the ear, it may be necessary to remove or remodel some of the cartilage. After such alterations are complete, sutures and bandages are put in place to maintain the new form. Sutures are generally removed within a few days in a follow up appointment with Dr. Branman. Otoplasty can be performed in our Little Rock office or an outpatient surgical center. This procedure is performed under general anesthesia. After ear surgery, the aesthetic improvement will be readily apparent, although the final result will not be evident for several weeks due to healing, swelling, and other natural changes. It will be necessary to protect the ears from pressure, trauma, or bending until healing is complete. A special headband is often used to protect the ears during recovery. Most patients return to work or school within 2 days and fully return to their normal routine after 2 weeks. The discomfort associated with this surgery is minimal, so pain medication is not typically needed. All surgeries carry some amount of risk. Otoplasty can significantly improve the appearance of a person’s ears, but the degree of improvement often varies. Most patients are very satisfied with the results. If you have questions about the risks, benefits, or cost of otoplasty in Little Rock, feel free to give us a call. 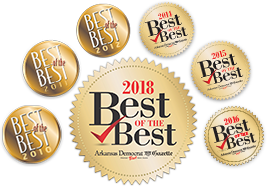 Ear surgery, and all cosmetic surgery procedures, are performed by Dr. Rhys Branman at Arkansas Surgical Hospital or in our in-office surgical suite.